Playing it safe isn't always good. This can be said when you are cooking or going out to eat. For example, my mom and I were recently in New York City. I conducted cooking demos from my cookbook for Women's Health magazine's "Are You Game" event. We asked some of the ladies at the event for suggestions for dinner. 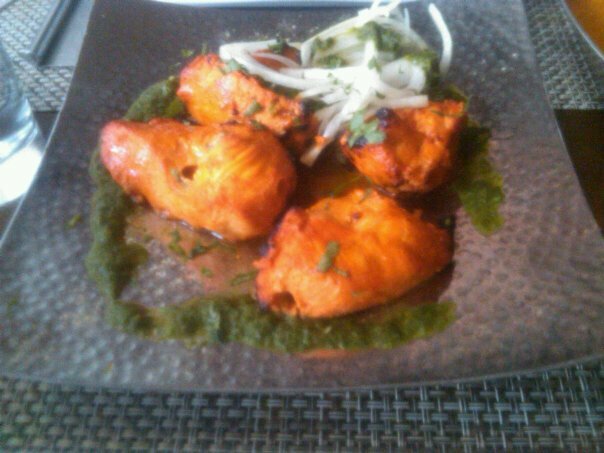 One of the ladies shared with us about an Indian restaurant that she loves! I knew what my mom's first reaction would be. Mom- "I don't know about Indian food." I reminded her that she has had Indian cuisine before and liked it. Have you ever wondered what the contestants ate while filming for "Masterchef"? Well, we ate whatever was available at the hotel. That got old after a while so we decided to order in one night. Faruq suggested we order from his favorite Indian restaurant. 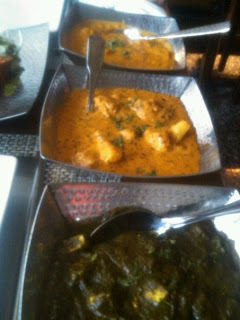 I can't think of the name now, but anyway I had never had Indian cuisine at this point. I decided that I wouldn't order anything off the menu but would just try a little of everyone else's food. Faruq ordered plenty of extra food especially naan, Indian bread. I loved everything I tried! I couldn't remember the names of anything except saag paneer (or creamed spinach). I decided to order Indian food from the same restaurant when my parents and I were in Los Angeles last. They enjoyed it! The Tandoori Chicken was so packed with flavor. It has to be the most flavorful chicken I have ever had. Then I dipped into the spinach, cauliflower, and shrimp dishes. I almost don't have words to describe how good all of those dishes tasted. The shrimp had a spice to it that made you want more. The cauliflower had a butter flavor and the spinach was creamy and delish. 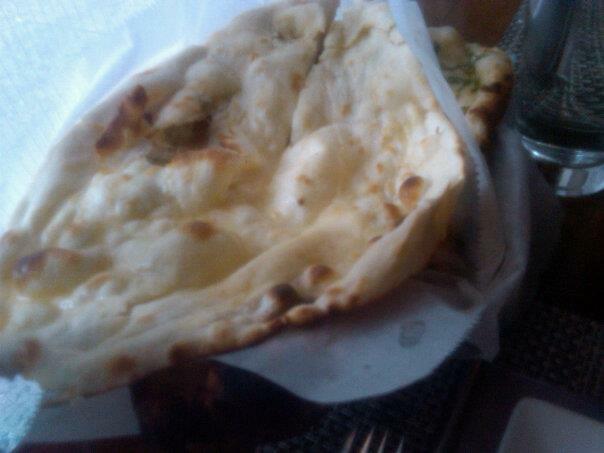 I used the naan to sop up any sauce left on my plate. Sheetal shared with me that traditionally Indian cusine is eaten with your hands using naan. I left Bhatti Indian Grill with inspiration to use some of their flavor combinations in my own cooking. So I did just that. I decided to prepare pork chops for dinner last night but I wanted to pack in a lot of flavor into them. I combined several spices with plain yogurt, lemon juice, crushed garlic and ginger, and salt. I allowed the butterflied pork chops to marinade in the yogurt mixture for about 2 hours. Meanwhile, I prepared my stuffing which was cubed green apple, green tomato, and leek. I sauteed these ingredients in butter over medium heat for about 15 minutes or until the green apples were soft. I then seasoned the vegetables and fruit with salt. I removed the pork chops and wiped off the excess marinade. I stuffed each pork chop with the green apple mixture and secured with toothpicks. You want to be sure to grease your grill pan and heat it over medium-high heat. Once hot, I placed the pork chops into the grill pan (toothpicks sticking up). After 5 minutes, I removed the toothpicks and carefully flipped the pork chops over. Cook the pork chops for another 5 minutes. I removed the pork chops from the grill pan and placed into a baking dish. Lastly, I brushed the rest of the marinade over the pork chops and baked them in a preheated 350 degree oven for about 15-18 minutes, depending on the thickness of the pork chops. September 9th was my younger sister, Brittyn's 22nd birthday. Birthdays in my family are a big deal. I wasn't going to miss spending her birthday with her so I flew Britt to Dallas so she could spend the weekend with my mom and I. I wanted to make this birthday extra special for Brittyn since last year friends and family were gathered around watching one of my episodes of Masterchef on her birthday. This year it was going to be all about her. I first surprised her with a limo ride to dinner. After having asked several people their advice on a restaurant to go to for dinner, we finally decided to go to Tillman's Roadhouse in the Bishop Arts area in downtown Dallas. The restaurant had also just been featured on Food Network. Immediately upon walking into the restaurant, I knew this was going to be a fun place. The decor is rustic but chic. So lets move on to the most important part, the FOOD! You are immediately served complimentary truffle butter popcorn. If this was any indication of what was to come, I would be a happy girl. When I am struggling over what to order at a restaurant after reading a menu, I like to ask the waiter/waitress for their recommendations. I did this at Tillman's and was told to be sure to order the trio of fries. From left to right, chili dusted purple peruvian, smoked salt sweet potato fries, and parmesan black pepper kennebec served with homemade ketchup and horseradish pickle mayo. I am not a french fry fan but these fries were good. I especially liked the sweet potato fries. Creamy and silky smooth mashed potatoes coated my taste buds with the most wonderful flavor and texture. Then the steak component of the chicken fried steak, isn't just any kind of steak but a filet. Served alongside was green beans which wasn't just your run-of-the-meal green beans. These green beans had good flavor. Having grown up eating what I call country fried steak, this was the best I have ever had! And that was it........just joking you know me better than that. A meal isn't complete without a little dessert and this one was extra special. Served tableside was their S'mores. Everything is homemade from their marshmallows to their graham crackers. Then toast your marshmallow over the open flame and sandwich between chocolate and graham crackers. They were finger licking good! You can create this same amazing treat at home using my Agave Marshmallow recipe in my cookbook. Have fun flavoring your marshmallows with your favorite flavor! And the night wouldn't be complete without the waiters singing happy birthday to my sister, Brittyn on her special birthday! 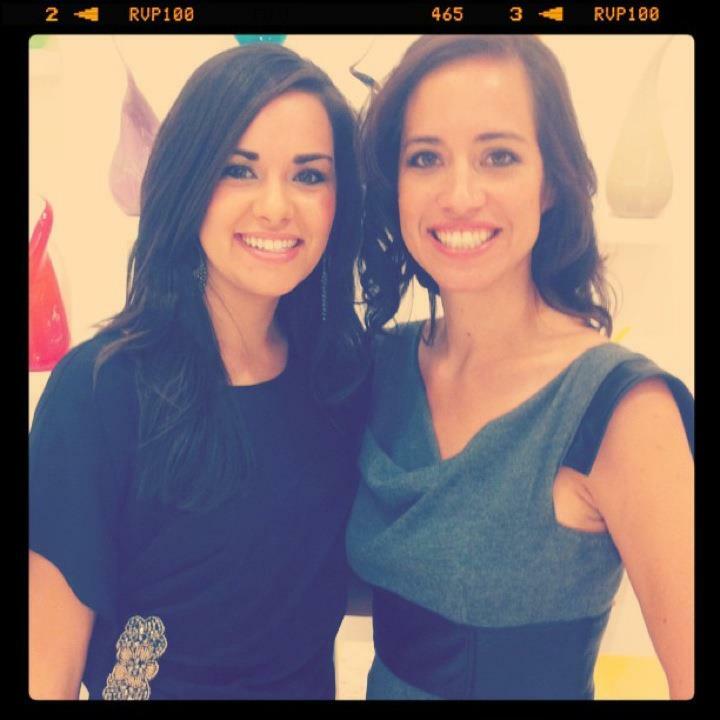 My trip to Dallas included two cookbook signings, the first at Neiman Marcus Willowbend's Fashion's Night Out and the other at Preston Royal's Barnes and Nobles. By the way, if you are in the area, I have signed copies of my cookbook at the Barnes and Nobles. When I was not signing cookbooks, I was eating my way through Dallas/Plano. Located close to our hotel was Kent Rathbun's, known for beating Bobby Flay on Iron Chef, restaurant- Japsers. After having heard a few recommendations, one being from a woman in the bathroom of our hotel ha ha!, we went for dinner. Jaspers considers its style of food to be Gourmet Backyard Cuisine. From first glance at the menu, I knew I would be in for a treat. My mom/traveling companion/assistant and I started off with their caesar salad. The waiter told us how their caesar dressing was given some kind of award for being the best. It was a good start to our meal too! For our entree, we shared their slow smoked baby back ribs with ancho barbeque sauce and creamy "baked potato" salad. We also ordered a side of their bourbon creamed sweet corn. Smoky, rich tomato bbq sauce covered by fingers and lips with flavorful goodness. 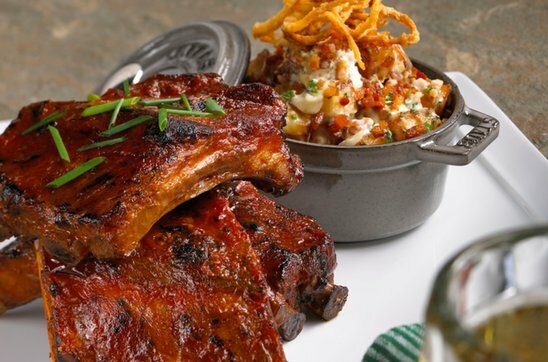 Ribs should only be eaten by hand, even in nice restaurants. It's the only way ha ha! The potato salad was killer! Creamy sour cream coated potatoes with crunchy bits of bacon was the perfect compliment to the ribs. This potato salad was very addictive! We had to order the corn because it sounded unique and what is better with ribs and potato salad than corn. 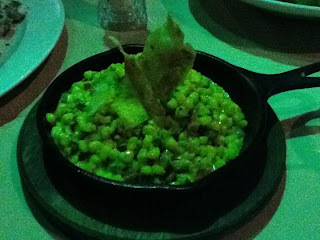 This was the Best Thing I Have Ever Ate- Corn! It wasn't creamed style corn but sweet kernels in a light creamy sauce. The hint of Boubon gave the corn another level of flavor. On top of the corn was thin strips of fried potato. I could have dove into this cast-iron skillet, it was that good! We loved it so much that we went back for lunch the next day. I flew in my sister for her birthday and I knew she would love the food. How can I put a modern, fresh twist on your favorite food? After reading your comments, I chose to put a modern,fresh twist on the comfort food- meatloaf. Sometimes meatloaf gets a bad rap. It doesn't have to be flavorless ground meat topped with ketchup. After a lot of brainstorming, I came up with pesto and mozzerella cheese stuffed meatloaf topped with roasted tomatoes. In a medium bowl, combine ground turkey, egg, breadcrumbs, milk, ¼ tsp. salt, and 1/8 tsp. pepper. Mix until combined. Spoon half of the turkey mixture into a 8x8 glass baking dish and form into an oval loaf. Spread the pesto over the loaf then top with mozzarella cheese. Top with the remaining turkey mixture. Form the mixture over the pesto and mozzarella and seal completely. Bake for 30 minutes. Remove from the oven and layer tomato slices over the turkey loaf. Sprinkle with ¼ tsp. salt and 1/8 tsp. pepper. Drizzle olive oil over tomato slices. Bake for another 15 minutes. Allow to rest for 5 minutes. Preheat the oven to 350 degrees. Place the walnuts on a baking sheet and bake until lightly toasted, about 5 minutes. Place the spinach and basil in a food processor. Add the toasted walnuts, garlic, salt, and pepper. Process until it begins to form a paste, about 2 minutes. With the processor running, drizzle in butter and olive oil. Add the parmesan cheese and pulse two or three times. Season to taste with more salt and pepper. Transfer the pesto to a small bowl. Being creative in the kitchen is what cooking is all about for me. Have fun in the kitchen! Serve my cauliflower mac n'cheese (from my cookbook- Modern Hospitality), a modern, fresh twist on mac n'cheese, with this meatloaf for a great comfort meal.